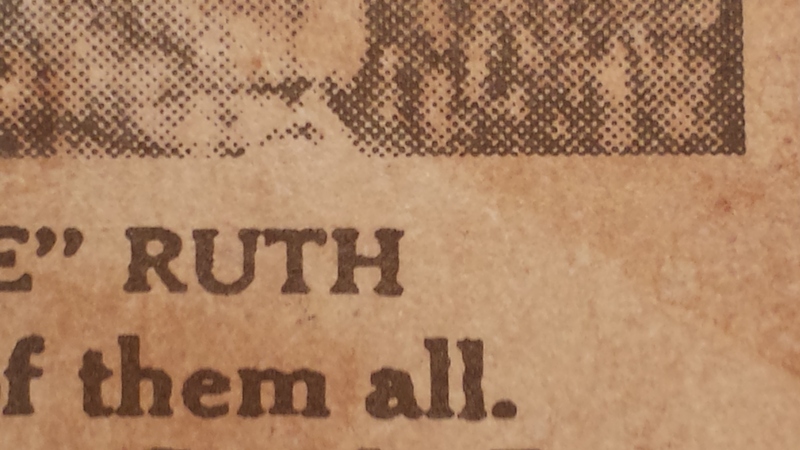 Two card sets from 1928 have the distinction of being more known for fakes than the real thing. It seems that there are more fakes on the market than real Fro-Joy and George Ruth Candy cards. 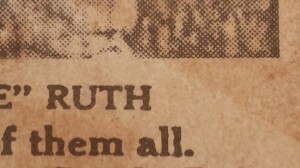 The Ruth Candy cards may be harder to find than Fro-Joy cards. 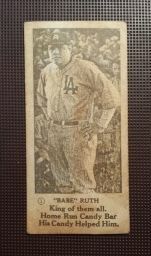 While I do see real Fro-Joy cards mixed in between all the fakes, I rarely see real Ruth Candy cards. Both cards are printed using a printing technique known as photoengraving. This type of printing is not too different from what is used now when printing the photo on a card. At first glance, the stock is wrong. The staining is also artificial and appears “forced.” This particular staining was created using a substance such as coffee. It becomes clear that the image is all wrong. Just like on the Fro-Joy cards, the photoengraved image should be completely compiled of print dots. No blank spaces. Even a lighter area of the image will still have fine dots. As you can see in the image above, the area just above “RUTH” shows portions of his uniform that are blank stock. This would not be on an authentic card. Lastly, the type should be examined. The letters should appear almost watery with a “rind” edge where the ink almost pooled to the outer edge of the lettering. Think of the T206 typeset. Take a look at the name under a loupe and you will see this effect.